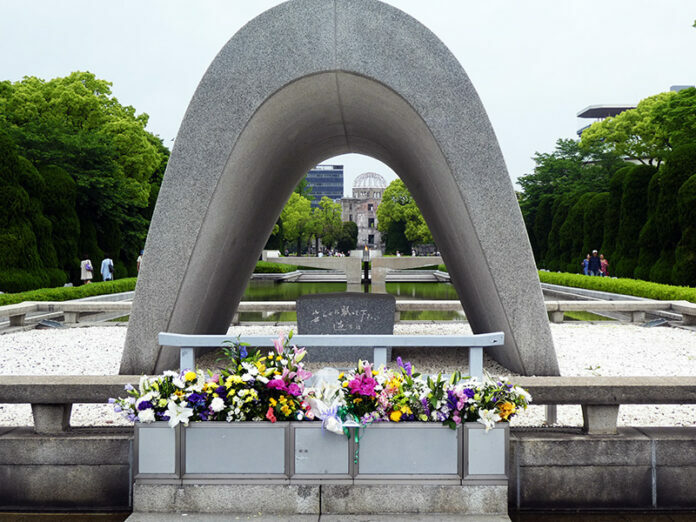 The grounds of the Hiroshima Peace Memorial Park include the Atomic Bomb Dome, the flame of peace, cenotaph, children’s monument and peace bell. We were fortunate enough to spend two days at this site surveying the grounds and appreciating the monuments and the significance of why they are here. As we walked around the grounds here we came across several groups of school children on field trips, if you will. They carried around laminated pieces of paper with identifying words on them. They used these cards to practice their English, asking us questions and asking us to use the paper to answer them. They were darling children and it was fun to help them practice learning new skills. The Peace Bell is a monument to abolishing nuclear weapons. All who visit are invited to ring the bell. 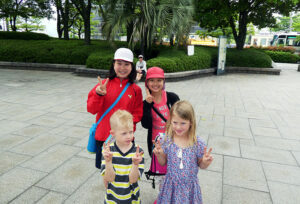 Doing so casts a prayer for world peace. It is a grand structure and the magnanimous bell strikes loudly for everyone in the park to hear. The constant ringing is a welcoming sound. Origami cranes have come to be synonymous with Hiroshima, signifying the victims of the nuclear weapon that decimated Hiroshima in 1945. Sadako Sasaki was a toddler when the blast hit and by age 9 developed leukemia. 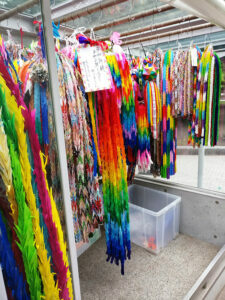 She believed if she could fold 1,000 paper cranes her wish to be healed would be granted. 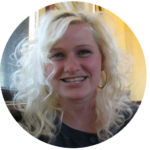 When she ran out of oragami paper, she used tissues, napkins, and candy wrappers. She died before she was able to complete the project, and her classmates at school decided to finish the project in her honor. The project has never stopped, and the cranes are housed at the Children’s Monument. It is overpowering and overwhelming to see the vast number of hanging cranes here. Everyone who visits is invited and welcome to bring additional cranes to add to the growing number. Our children had been gifted cranes by passersby and they willingly left them here. 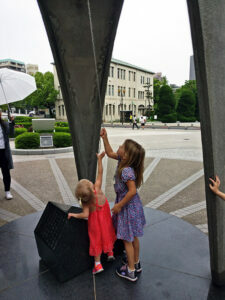 19 years after the bomb was dropped, this monument was erected and the flame was lit as a sign to the world that nuclear weapons have no place on the Earth. It will burn until all nuclear weapons have been eliminated. To date, 200 countries have signed the nonproliferation of nuclear weapons treaty. The names of every victim of the bombing are inscribed in the cenotaph, either on the day or as a result of later radiation. Names are still being added daily. 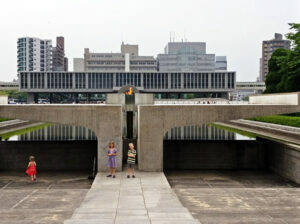 The view through the cenotaph is a perfect vision of the eternal flame lit in front of the Atomic Bomb Dome signifying the full circle of devastation. 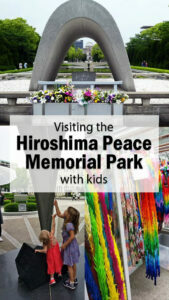 The park is a sobering demonstration of the effects of nuclear weapons both as individual monuments and in its entirety. Each piece should be distinguished on its own to paint a picture of the long term effects of war. ►For Kids: The Peace Memorial Park expresses the history of nuclear events in Hiroshima, and the impact they had on so many lives. It also reflects on how these events can and have shaped our future. This place has extremely significant meaning for all mankind and is thoughtfully done as wonderful tribute and can be viewed through the eyes of the young and old alike. Many children died here, so while care should be taken in explaining the events, it should not be shied away from. From here, a visit to the Peace Memorial Museum and the National Peace Memorial Hall are necessary to understand the full implications of the past and the future. ► Nap-Time Version: The 4 monuments that make up the Peace Memorial Park, including the peace bell, children’s monument, flame of peace and cenotaph. Each has its own story and reason for inclusion. These are honored monuments both to the city, the past, and the future. 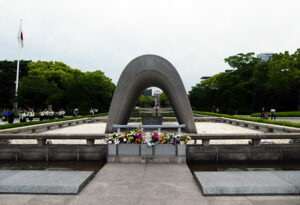 Click here for more on the Atomic Bomb and other sites and attractions in Hiroshima.